Unlike most of our work, this picture was not taken in the wild. 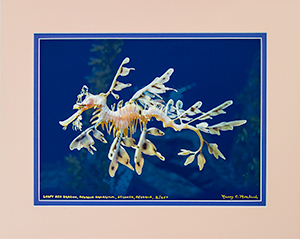 Leafy sea dragons live in the coastal waters all along the southern edge of Australia. They are usually found over sand patches or around kelp-covered rocks and clumps of sea grass in water up to 160 feet deep. They eat small amphipods and mysid shrimp. They rely on camouflage for protection. They have been known to stay in one place for almost three days and one was timed swimming about eight feet per minute. Like seahorses, the males care for the eggs. Females deposit up to 200 eggs on the underside of the male’s tail. After they hatch, the young sea dragons are on their own. They eat small amphipods and mysid shrimp and grow to about ten inches. In the wild, only 5% live to maturity. In captivity, the survival rate just recently exceeded zero for the first time. They have been protected by the Australian government since the early 1990s. 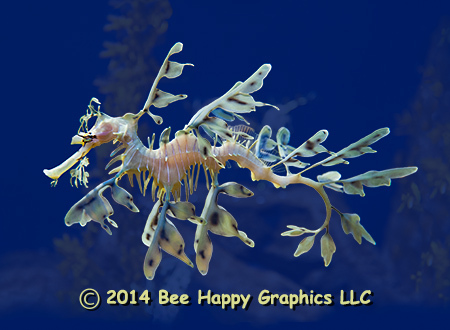 You can have your own leafy sea dragon for under $15,000, but they are very difficult to maintain. Photographic details: Canon EOS 20D camera w/ 16-35mm lens set at 33mm. No flash was used. Camera was on f/3.2 for 1/40 sec at ISO 1600. Fine Art Paper 11" x 161/2" 15" x 21"
Canvas N/A 21" x 28"